Emperor Julian, photo by Harold Davis. 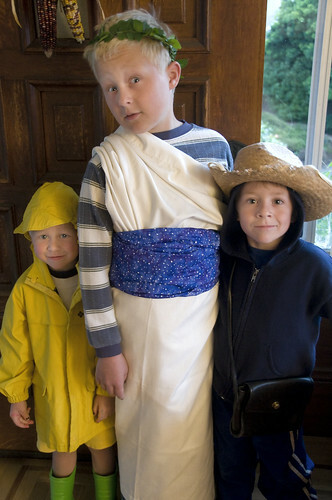 In this photo Emperor Julian is shown with his brothers Indiana Skywalker (a/k/a the Alien Monster, on the right) and the deceptively innocent-looking Holy Terror (stage left). Worth noting: In the grand tradition of Scarlett O’Hara and Carol Burnett, Phyllis fashioned the Emperor Julian’s toga from old curtains. The laurel wreath was likewise handcrafted using an old coat hanger and leaves from our garden. 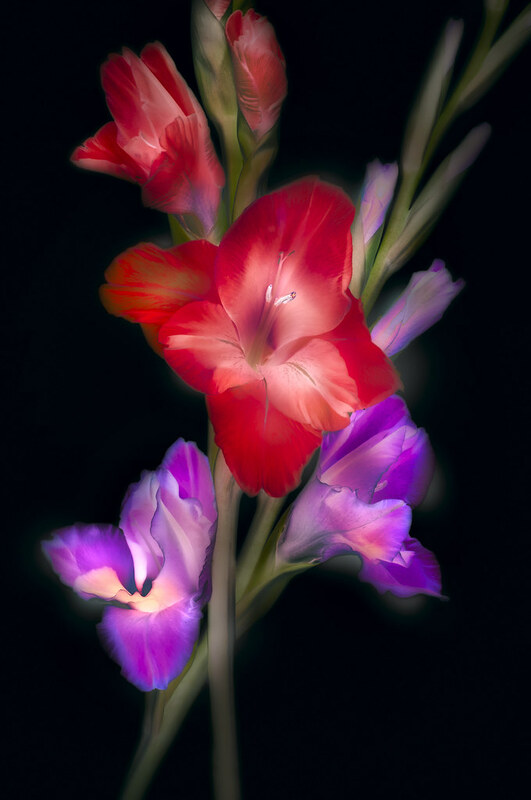 Red and Purple Gladiola, photo by Harold Davis. View this image larger. Briefly noted: I carefully positioned the gladiola stems on a light box. I photographed almost straight down, but at a slight angle, using a telephoto macro. I made a wide range of exposures so I could be sure of capturing both the transparent effect and the entire possible dynamic range of the subject. In Photoshop, I placed the different exposures in a layer stack, and used masking to control the color saturation. Then I inverted the white background and used my patent pending cross-channel blending system to bring out the colors (only kidding about the patent!). Alien Monster, photo by Harold Davis. 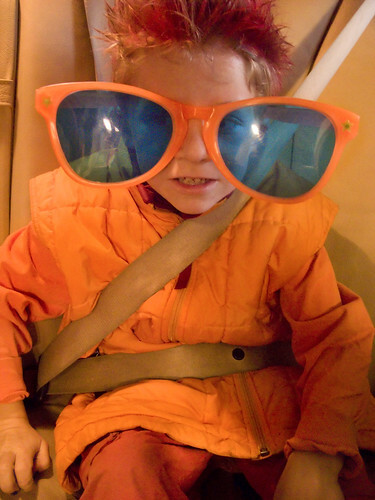 Nicky went to his school Halloween parade dressed as an “alien monster” in huge orange sunglasses, red spiked hair, and his mom’s orange vest. Black finger nails—Phyllis painted all three boys—are not apparent in this photo. Here’s a photo of Nicky from a Halloween d’année passé (Nicky is the little pirate on the left). Edge of Night, photo by Harold Davis. View this image larger. “Holy Stacking Star Trails, Batman!”…As many of you know, I’ve been shooting and then stacking star trails lately. 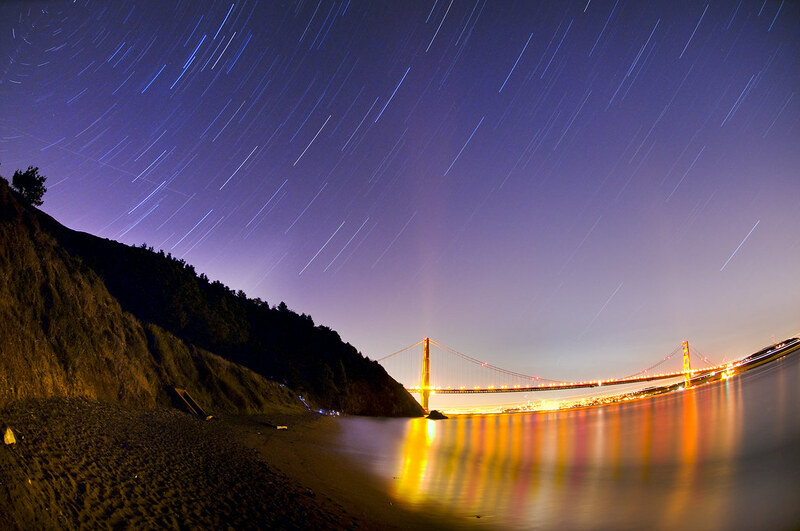 The idea is to take numerous “shorter” exposures that include the night sky, rather than one longer exposure. The shorter exposures are then composited together (they are “stacked” one on top of other). A stacked composite image is less noisy than a single very long exposure. The effective exposure time possible with a single battery is extended by segmenting the exposure (see my comment about long exposure noise reduction below). 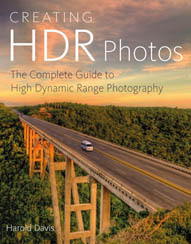 Single captures that contain disturbing elements such as airplane trails or light from the photographer’s headlamp can be eliminated from the stack if desired. In other words, stacking gives you granular control over the time slices. The most important thing when attempting to photograph star trails for stacking, of course, is to find the right view. Ideally, the scene should be free of ambient light—this goes for moonlight, city light pollution, and car headlights. Since my star trail images include a landscape in the foreground, I like to find a location in which the general scene (and not only the night sky) is interesting. To get the effect of circular star trails, your camera should be pointed north. 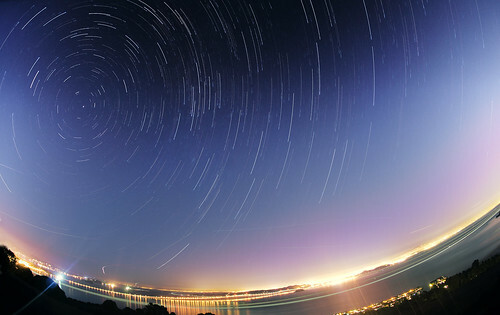 Polaris, the North Star, will be stationary in the center of circular moving stars. Between Earth and Sky illustrates this well. 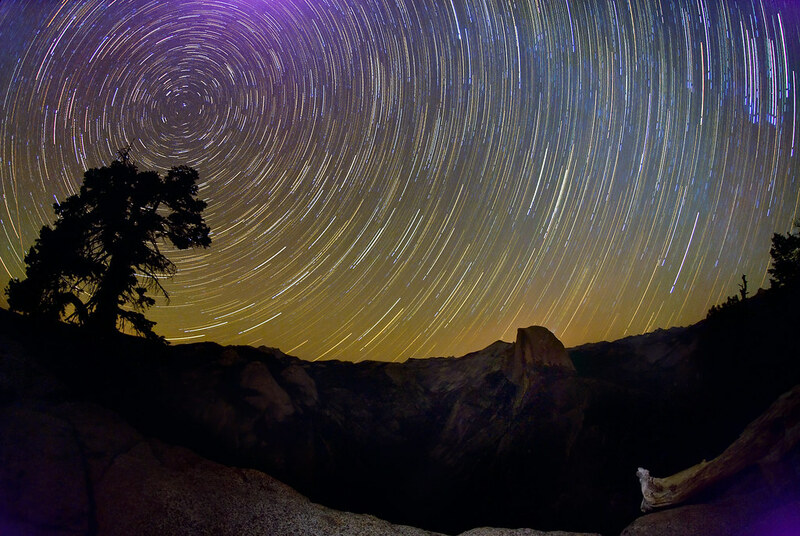 In addition, the wider the angle of the lens you use the greater the curvature effect in the star trails. I exclusively use extreme wide angle lenses for these images, most of the time my 10.5mm digital fisheye lens. If you stack 12 four minute exposure times you get a total elapsed time of about 48 minutes. To achieve this, you need a sturdy tripod and a programmable timer. 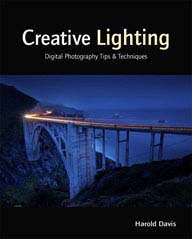 In this example, you put the camera on manual exposure and Bulb. Next, set the time for 12 exposures, each of a duration of four minutes, with a four minute and one second interval between the start of each exposure. It’s important to turn in-camera long exposure noise reduction off. As I noted earlier, this gains you battery life (and noise reduction for the four minute exposures wouldn’t help you much with the star trail portions of the images). If you left in-camera noise reduction on (which I generally do for longer “straight” night time exposures like Stars Rush In or Tennessee Beach at Night), the elapsed duration following the start of the exposure would be far greater than four minutes, and the four minute and one second interval setting wouldn’t work. Even if you could figure out the right interval, the “missing” time would leave gaps in the trails. I often like to also expose a longer exposure of the foreground, for example eight minutes at ISO 100 and f/2.8. I’ll use in-camera long exposure noise reduction on this one, so the actual time it takes is close to 16 minutes. If this foreground exposure turns out well, I’ll blend it into the composite using a layer mask and gradient. Here’s more about post-processing stacked star trails. Worth noting: I use the Unsharp Mask filter on the Luminance channel of the star trails, to bring out their detail, but I leave the foreground relatively soft. Here are some of my recent stacked images in the order I made them (so you can witness my learning curve! ), with links to the stories I wrote about creating the images. Starry Night 3, photo by Harold Davis. View this image larger. We Are Not Alone, photo by Harold Davis. View this image larger. Mark and I climbed to the top of a hill in Tiburon. There was a clear view north towards the Richmond Bridge. At this time of year, the sun sets early, and soon it was getting darker and colder. Fog was coming in through the Golden Gate and spreading across the Bay, but the northern vista was still clear. This is a stacked composite consisting of 15 exposures made with my 10.5mm digital fisheye lens. Each exposure was shot at 4 minutes, ISO 100, and f/5.6. The total elapsed exposure time was thus about an hour. Note that with all the ambient light in the city sky, the star trails are not as bright as they are in a darker environment. For example, the stars seem very bright indeed in this version of Starry Night, which shows the Yosemite sky. 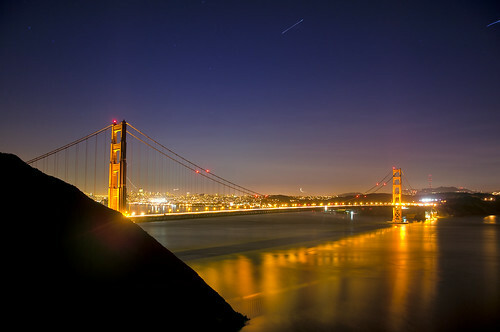 The green line across the foreground is a ferry boat that made its way into Larkspur during a couple of the exposures. Bridge from a Different Angle, photo by Harold Davis. View this image larger. There’s always a new angle from which to photograph the Golden Gate Bridge. This image is from the trail on my way up from Kirby Cove on my way to Battery Spencer and the parking lot. Katie Rose’s Smile, photo by Harold Davis. Katie Rose was two months old yesterday “gestationally corrected.” Meaning, if she had been born when she was supposed to be born instead of born early she would be two months old. 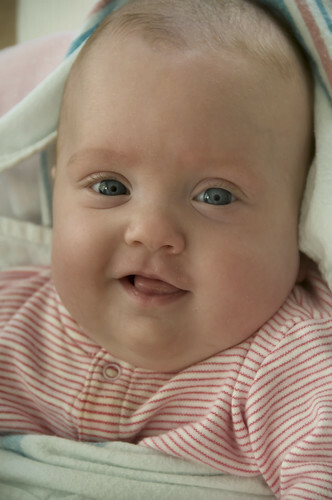 She is acting for all the world like a normal, happy two-month-old baby. 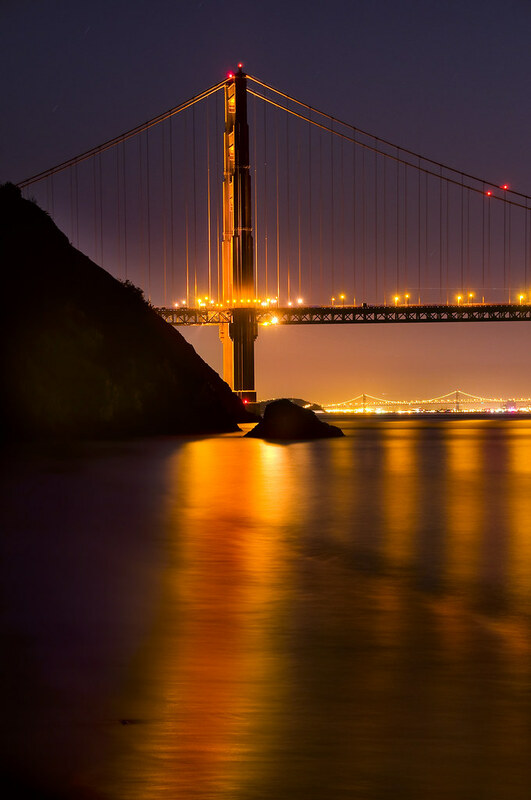 Night View of Bodega Bay, photo by Harold Davis. View this image larger. This view is looking north out from the tip of Point Reyes across Bodega Bay. This is a storm-bound, windswept coast, often shrouded in fog, so I was lucky to get clear skies for the star trails. 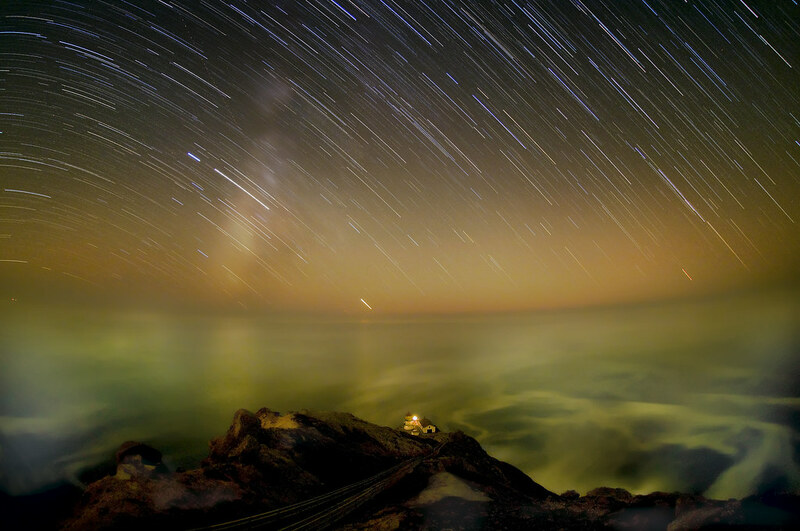 I exposed the photos used in this stack using my backup camera, a Nikon D200, while I photographed Point Reyes Lighthouse (Edge of Night) with my other camera (a D300). I had two tripods with me, but this one was kind of minature so I had to wedge it into the gap between a sign and the fence. Compared to the D300, the D200 sensor seems to really heat up, which is where the purple flares come from. I kind of like them. Here’s another example showing the D200 sensor flaring, these star circles are from Yosemite at night. 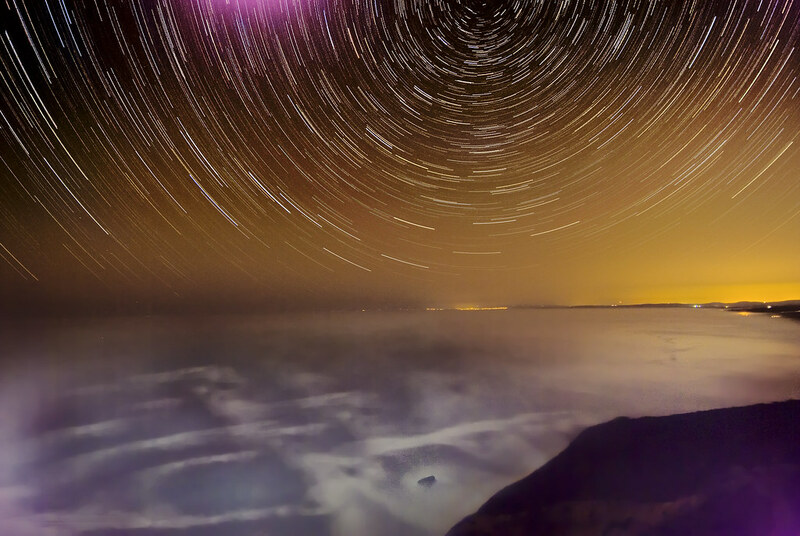 Against the backdrop of pounding surf and a light mist on the ocean, I photographed star trails behind Point Reyes Lighthouse in this portrait of the edge of night. 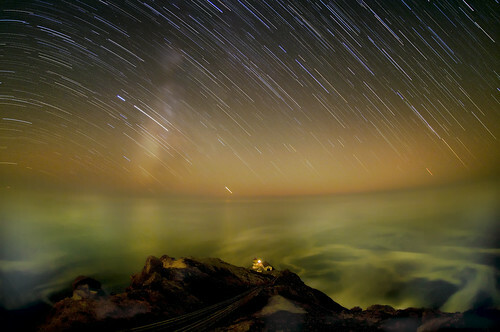 Related image: Night at Point Reyes Lighthouse. Under the Bridge, photo by Harold Davis. View this image larger. Briefly noted: Multitasking while shooting star trails for stacking at Kirby Cove, I captured this view of the North tower of the Golden Gate Bridge with the Bay Bridge underneath. A somewhat different take on the same composition as 2 Bridge Vu (third down on the linked page). The point of the photo for me is the reflection of the tower on the water, and how it visually behaves over the course of the two minute exposure. Here’s another bridge tower reflection in the surf. Bridge and Stars, photo by Harold Davis. View this image larger. Last night at Kirby Cove the weather was balmy. I ate a chicken sandwich from Bakesale Betty’s in the dark and called home to say goodnight to the kids while the timer took care of generating thirteen exposures, each at four minutes and f/5.6 (ISO 100). I had to throw away one of the exposures later because the airplane trails in it were just too distracting. It’s surprisingly hard to eat a Bakesale Betty chicken sandwich in the dark. The ambient light from San Francisco made the stars relatively less bright compared to the wilderness, and I wasn’t pointed north so my circles were smaller. Fuschia Gradient, photo by Harold Davis. View this image larger. Down the block, in front of Heidi’s house, there’s a great fuschia that grows buds like this one (Jet Engine and Doodling show buds from the same plant last year). Fortunately, Heidi has given me permission to snip buds whenever I like, so I can have an affair with the flowers every year. 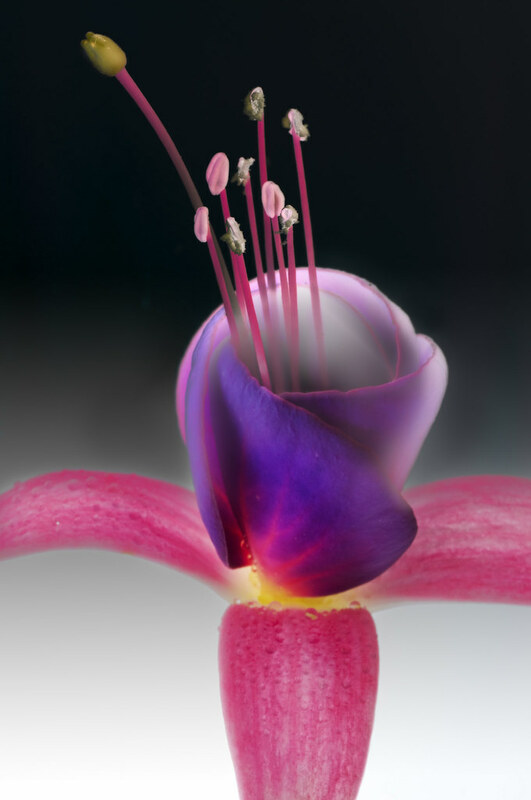 This bud was photographed on a light box using a macro lens and extension tube. In Photoshop, I converted the image to LAB color. Next, I inverted the image (to get the black background) and combined the inversion with the original using a layer mask and a gradient blend. Carrying Katie Rose, photo by Harold Davis. Katie Rose is thriving. Tolstoy wrote that “happy families are all alike.” Indeed, there’s not much to tell. Carrying Katie Rose is like carrying a normal two-month-old, and it is easy to forget how small she once was, and what a miracle she is. I feel blessed every time I see the intelligence behind her gaze. I’ve written a “report” about the day Katie Rose was born; you can read it here. 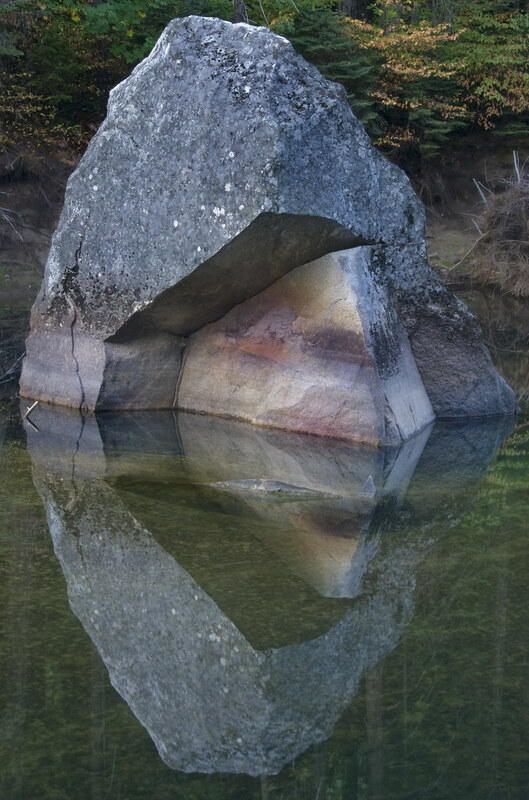 Merced Reflections, photo by Harold Davis. View this image larger. Briefly noted: Along the Merced River the seasonally low water was totally still in the morning, leading to crystal clear reflections. 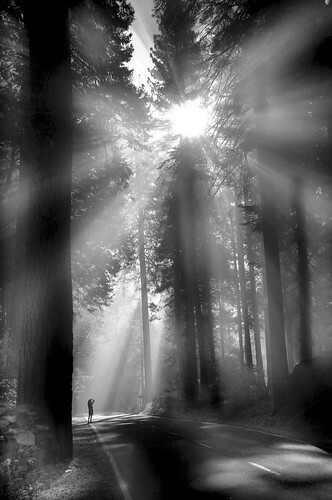 Glory, photo by Harold Davis. View this image larger. Crawling out of my sleeping bag to the sounds of a massive rock slide (here’s the story), I found the Yosemite Valley floor filled with dust. Whatever the cause, the crepuscular rays wrought by the rising sun struck me (and the other observer in this photo) as glorious and spectacular. Essentially monochrome, I converted the image to black and white in Photoshop using multiple black & white adjustment layers (my process for b&w conversion is partly explained here).